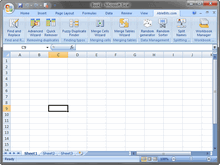 If working with Microsoft Excel worksheets is an indispensable part of your daily work, then you will certainly be delighted to have 12 handy time-saving tools at hand, which will free you from the burden of all those repetitive, time-consuming and error-prone routines. 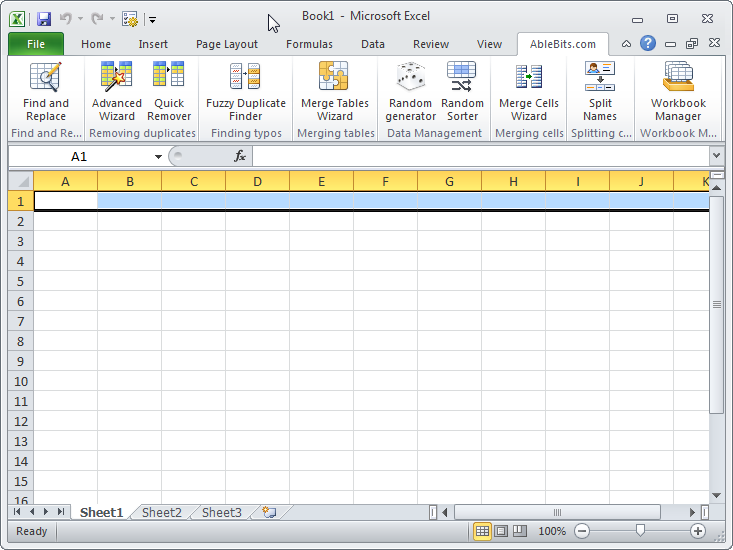 You will get 50% discount for all our new add-ins for Microsoft Excel. Find and remove thousands of duplicates or unique entries in seconds. Search through spreadsheets with up to 1 million rows, choose any columns for comparison. 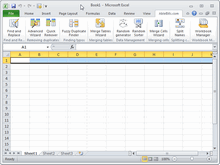 Combine matching data from 2 Excel worksheets into one in seconds. Easy-to-understand alternative to Excel Vlookup function. Merge data from duplicate rows into one based on the selected key column or columns. Combine all values or pull unique data only ignoring duplicates and skipping empty cells. Merge cells, rows and columns in a click. 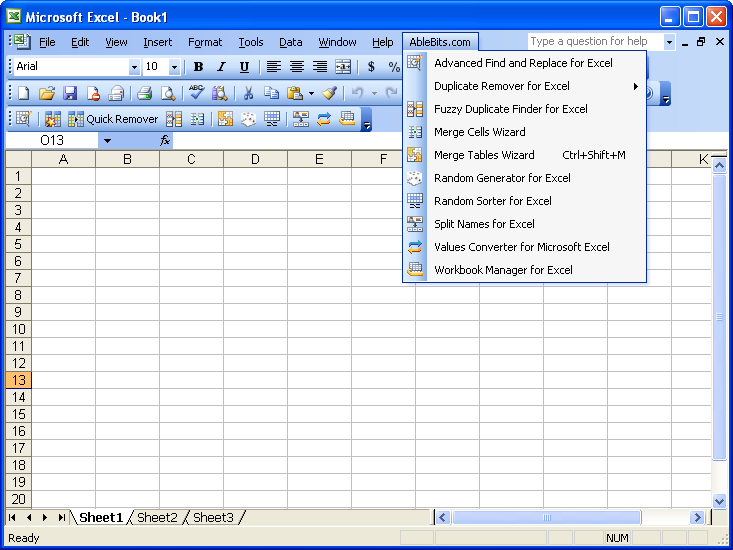 All data are preserved even if the selection contains multiple values. 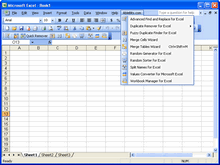 Search and correct partial duplicates, similart records, misprints and typos from Excel worksheets. Search in all or selected worksheets at a time. Simultaneous search in values, formulas, comments and hyperlinks. Generate unique random numbers, strings, dates, passwords and Boolean. Fill the range randomly with custom list values. Shuffle individual cells or entire rows and columns; get a random sample of your data. Perform various conversions between more than 200 measurement units in 18 different categories. Navigate between multiple workbooks with comfort and ease. Rename, delete, sort your worksheets in a click. 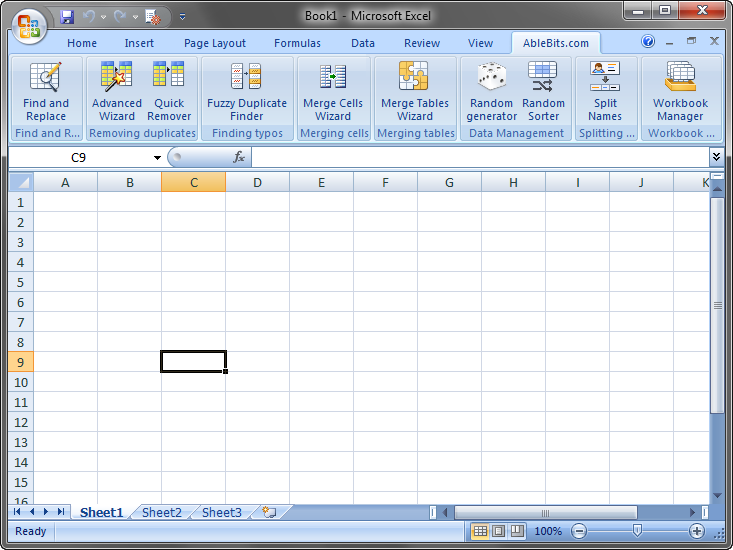 Delete excess spaces and line breaks, change case, convert numbers formatted as text to numbers & more. Your company purchased several licenses of the add-in. Now you, as administrator, need to install the software for your end-users and naturally you want to do this quickly and smoothly. All you need is the add-in's setup file (Download) and some folder on your network drive accessible by all users for which the add-in should be installed. The setup files of all our add-ins are Windows installer packages (.MSI) and they support all Windows Installer command-line options. 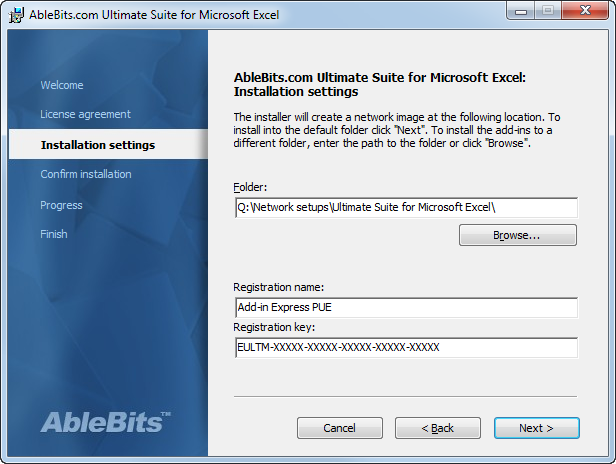 The add-in is installed only for the current user account, not for all users of the system. The license is per user, not per machine. You can install the add-in on 3 machines of the same user. Add-ins are installed into the user's personal folder, administrative or power-user permissions are not required. Our add-ins are compatible with all personal and server operating systems starting with version 2000. To track installations we use the online activation system on our activation server. The activation key is bound to the Hardware ID, which is a combination of hardware serial numbers. Single Terminal Server. Our add-ins work fine. A group of Terminal Servers with load balancing, a user has a roaming profile. Since activation is bound to the Hardware ID, it is lost every time the user switches to a new server. The good news is that it is solvable :-), please contact us. 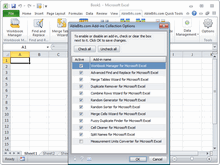 As an example, we are going to install the Add-ins Collection for Excel. Unpack the downloaded setup file to any folder. Finish the process and wait until the network image is created. TARGETDIR="setup folder" REGISTRATIONNAME="" and REGISTRATIONKEY="" - your license information. 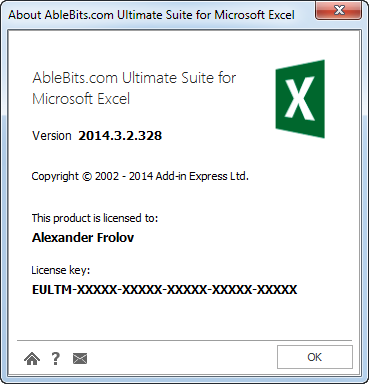 msiexec /a excel-addins-collection.msi TARGETDIR="Z:_Setups\Ablebits Add-ins Collection for Excel" REGISTRATIONNAME="Add-in Express Ltd." REGISTRATIONKEY="EACL2-XXXXX-XXXXX-XXXXX-XXXXX-XXXXX"
In this case the wizard will not disturb you; it will go unnoticeable and create a network image in the specified folder silently. We recommend choosing "Assign software" as a "Deployment type". In this mode the add-in will be installed for the users automatically next time they login to the domain. 2. Your users can also install the add-in themselves from the network image created by you, provided they have the rights to install software. The network image contains all the necessary registration information. An error may occur if your firewall blocks the attempts of the add-in activation module to connect to our activation server (http://www.activatenow.com). Ask your users to activate the add-in manually. To do this, they need to click the key icon at the bottom of the add-in's window or pane, choose "Manual Activation" and click the Go button on the next step. The activatenow.com page containing the activation code will open in their browser. They need to copy it and paste into the "Activation code" field, then click Next. If you have any questions, ideas or suggestions, do not hesitate to contact us. For quantities above 100 licenses or for Site licensing please contact us at sales@unitedaddins.com.